Sun Cellular hits back again for another postpaid internet plan offers after they offer prepaid unlisurf bundles for Opera Mini. 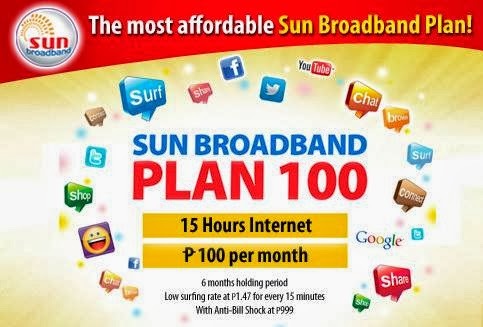 Sun Broadband Plan 100 gives you 15 hours of internet surfing and you will pay only 100 pesos. This plan will not cost you 10 pesos per hour, even lower than that as you will have five more hours if you pay it P10 per hour. Here's more guys, it's protected with anti bill shock so you don't need to worry about exceeding monthly charge. You will only pay up to 999 pesos if you exceed to 15 hours monthly internet surfing. 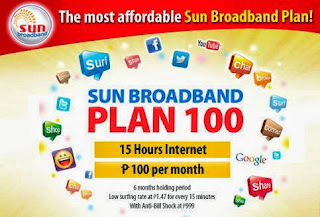 Just bring all Sun Postpaid Plan requirements to your nearest Sun Shop and inquire on how to process the application. You don't need to worry of getting disapproved at this plan gives you a greater chance to qualify.